One of the most annoying quirks with Android is that there usually isn’t an easy way to take screenshots, and the same holds true for the Motorola Xoom. So here are two ways to take screenshots with the Motorola Xoom. The first option is rather simple and does not require any rooting or technical work. This method should work with other Android Honeycomb tablets as well. The second option does require rooting the Xoom and then installing a screenshot app. This method requires downloading the Android SDK and then using the Dalvik Debug Monitor to capture screenshots, which means you have to have the Motorola Xoom plugged into your computer via USB to take screenshots—not exactly convenient. Download and install the Android SDK on your computer. 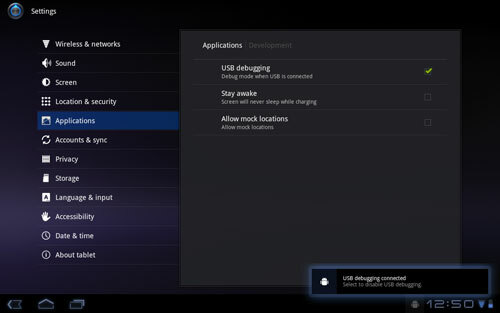 Turn on your Motorola Xoom, go to Settings – Applications – Development – make sure USB Debugging is checked. Plug the Xoom into your computer with the USB cable. Inside the tools folder, find and double-click on ddms.bat. This will launch the Dalvik Debug Monitor. Click on the device on the list then select Device – Screen Capture to launch the screenshot window. If you are having any issues, make sure the proper version of Java is installed on your computer. Also, if for some reason you are having problems with the Xoom’s USB drivers, they can be downloaded from Motorola support. If you don’t want to be tethered to your computer to take screenshots, you have to root the Motorola Xoom. There are several screenshot apps available via the Android Market, but unfortunately require a device to be rooted in most cases. To root your Motorola Xoom, follow the one-click root/unroot directions over at the XDA forums. There’s also a screenshot app at XDA called Screenshot ER that is known to work with the Motorola Xoom and other Honeycomb tablets. Wow, that is an awesoome info. I did not knew that but I think this is pretty cool. Taking screenshots is sometimes very useful and I appreciate doing this with Android very much. I will do this download right away. You can take a screen shot (in ICS and after) by pressing Volume Down + Power at the same time for a second. Works fine with 4.1.1 on a Xoom WiFi.